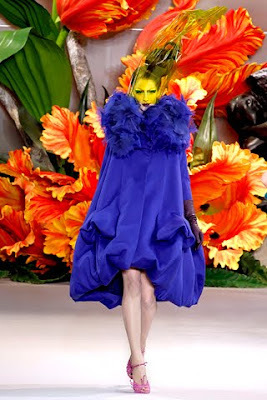 Paris Haute Couture Fall/Winter 2010 Kicked off with Christian Dior Fall 2010 Haute Couture Collection by John Galliano. 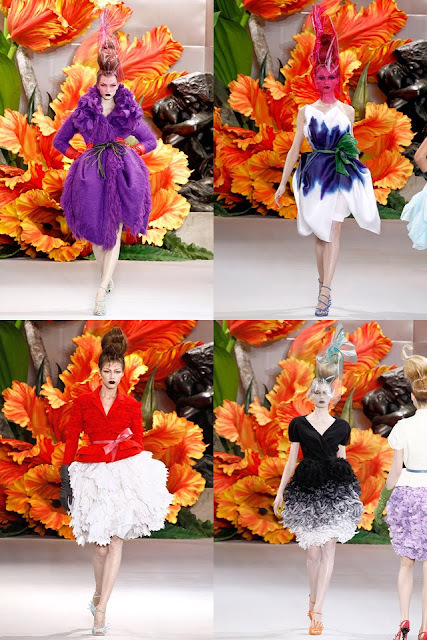 Show was all about bright colors, dreamy clothes, dramatic hairstyles and headgears, full skirts, cinched waists, floral-inspired fall 2010 couture collection and much more. I'm loving the whole floral inspired feminine collection theme going on here. soo creative. Even their headgear-like inverted cellophane bouquet wraps by Stephen Jones were stunning. This collection had a lot of coats shaped like a huge inverted daffodil and a dress in black taffeta that was hand-painted with pansies, jacket and skirt combinations like white felt over lilac organza, jade mohair with a swoop of portrait neckline over a petaled bubble of black organza, colored petal details delicately draped over ballooning skirts, cinched at the waist were gorgeous. LOVED all the mesmerizing colors of the dresses. Christian Dior Haute Couture Gowns were big, dreamy, beautiful, colorful and completely mesmerizing owing to cinched waists and layers and layers of detail and textures. My favorite dress out of the whole collection. The mixture of colors is simply beautiful. At the end, John Galliano, Dior’s designer said “I’m having a floral moment”. lovely dresses. I love them all. Its true art. I just love to look at them, its like candy for the eyes. I tend not to write many comments, but I glanced through a few responses on this page "Christian Dior Haute Couture Collection 2010". I actually do have 2 questions for you if it's okay. Could it be just me or does it look like like some of these comments look as if they are coming from brain dead people? :-P And, if you are writing at additional social sites, I would like to keep up with anything fresh you have to post. Could you make a list of every one of your shared pages like your linkedin profile, Facebook page or twitter feed? you amend your website, how could i subscribe for a weblog site? Hello There. I found your weblog the use of msn. This is a really well written article. I'll be sure to bookmark it and return to learn more of your helpful info. Thanks for the post. I will definitely comeback. am reading this impressive educational piece of writing here at my home. It's hard to come by knowledgeable people about this subject, however, you seem like you know what you're talking about! I've read stuff from. Many thanks for posting when you have the opportunity, Guess I'll just bookmark this blog. each other. If you're interested feel free to send me an e-mail. I look forward to hearing from you! Excellent blog by the way! I don't have time to go through it all at the moment but I have book-marked it and also added in your RSS feeds, so when I have time I will be back to read much more, Please do keep up the great work. Greetings from Los angeles! I'm bored at work so I decided to browse your blog on my iphone during lunch break. I really like the knowledge you provide here and can't wait to take a look when I get home. using WIFI, just 3G .. Anyhow, awesome site! Hi, Neat post. There is an issue along with your site in web explorer, would test this? I was recommended this website through my cousin. Thanks for sharing your thoughts about fourteenth. Hello! I could have sworn I've been to this web site before but after looking at some of the articles I realized it's new to me. of course like your web-site however you need to test the spelling on several of your posts. bothersome to tell the reality on the other hand I'll definitely come again again. A fascinating discussion is worth comment. 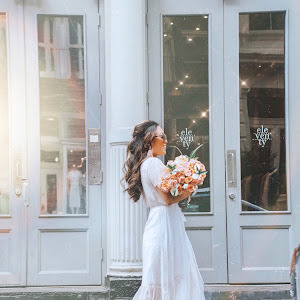 There's no doubt that that you ought to publish more about this subject, it may not be a taboo matter but usually people don't discuss these issues. this website as a finest web site for latest updates. What's up, just wanted to say, I liked this article. It was inspiring. Keep on posting! for information approximately this subject for ages and yours is the best I've discovered till now. But, what about the bottom line? Are you sure about the source? to say that I get in fact loved account your weblog posts. Any way I'll be subscribing on your augment or even I success you get right of entry to constantly quickly. Hi, I do think this is an excellent blog. I stumbledupon it ;) I will revisit yet again since I book-marked it.
! Finally I have found something that helped me. Thank you! I've a challenge that I am simply now running on, and I have been on the look out for such information. I'll immediately grab your rss as I can not find your e-mail subscription link or e-newsletter service. Do you have any? Kindly let me recognize in order that I may just subscribe. Thanks. look when I get home. I'm amazed at how quick your blog loaded on my mobile .. I'm not even using WIFI, just 3G . since I book-marked it. Money and freedom is the greatest way to change, may you be rich and continue to help others. just 3G .. Anyways, fantastic site! Great items from you, man. I have take note your stuff previous to and you're just extremely magnificent. I really like what you have acquired right here, certainly like what you are stating and the way in which during which you say it. You are making it enjoyable and you still take care of to keep it smart. I can not wait to learn far more from you. This is really a great web site. that, this is wonderful blog. A great read. I will definitely be back. It's great that you are getting thoughts from this article as well as from our dialogue made at this time. ..HaHa!) Great job. I really loved what you had to say, and more than that, how you presented it. that this write-up very compelled me to try and do so! Your writing style has been amazed me. Its like you read my thoughts! You seem to grasp so much approximately this, such as you wrote the e-book in it or something. What's up i am kavin, its my first time to commenting anywhere, when i read this piece of writing i thought i could also make comment due to this sensible article. What's Going down i am new to this, I stumbled upon this I have found It positively helpful and it has aided me out loads. I hope to contribute & help other users like its helped me. Great job. There are so many options out there that I'm completely overwhelmed .. Any ideas? Appreciate it! What's up colleagues, its impressive article about cultureand fully explained, keep it up all the time. What would you suggest about your publish that you made a few days in the past? back to read more, Please do keep up the superb b. You've made some decent points there. I checked on the internet for more information about the issue and found most individuals will go along with your views on this website. I've been surfing online more than 3 hours today, yet I never found any interesting article like yours. It is pretty worth enough for me. Personally, if all web owners and bloggers made good content as you did, the internet will be a lot more useful than ever before. I believe that is one of the most important information for me.